Birmingham, AL-based political blog The Progressive Electorate plans to interview congressional candidate (and current Jefferson County Commissioner) Sheila Smoot this evening beginning at 8 p.m. on Daily Kos. They’ve already posted three questions they plan to ask during the chat and they’re asking for folks to consider submitting others to the thread (thinking it means you may be able to submit your questions as comments to the post announcing tonight’s discussion too). Photo: Courtesy of the candidate’s Fan Page on Facebook. With 99% of the precincts reporting, William A. 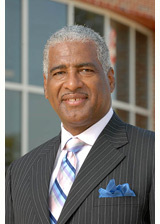 Bell, Sr. has been elected to serve out the remainder of Larry Langford‘s term as mayor of Birmingham, AL. Unofficial results show that approximately 41% of registered voters took part in the election to choose the chief executive for the state’s largest city (compared to 23% in the general election in December). Mr. Bell received 53.57% (25,354) while attorney Patrick Cooper received 46.4% (21,979) of the total vote. The election is scheduled to be certified on January 26 at 12 p.m. with provisional ballots to be counted at that time. Who do you trust politically, Birmingham? Which politician in metro Birmingham do you trust the most? Share your answers on Magic City Question.